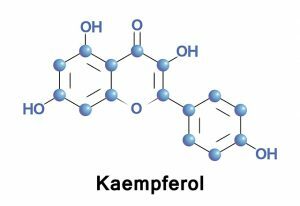 Kaempferol, a yellow-colored powder, is a flavonoid that can be found in various natural resources such as apples, onions, leeks, citrus fruits, grapes, red wines, and ginkgo biloba. Discovered in 1938 by Albert Szent-Györgyi, a Hungarian biochemist, it is known to be a strong antioxidant and can help prevent oxidative damage of the body’s cells, lipids, and the deoxyribonucleic acid (DNA). Kaempferol has been found to have hypoglycemic and antioxidant effects. The phytonutrient was also found to have antimicrobial effects. Another study found that Kaempferol-3-O-sophoroside (KPOS) possessed barrier integrity activity, inhibitory activity on cell adhesion, and migration to endothelial cells by blocking the activation of NF-κB expression and production of TNF-α which then endorsed its usefulness as therapy for vascular inflammatory diseases. It also lessens the risk of cardiovascular diseases. A study found that through alterations in lipoprotein metabolism, oxidative stress, and inflammatory markers, intake of the nutrient beneficially affected key risk factors of coronary heart disease in both pre- and postmenopausal women. A study also found out that upon the investigation of neuroprotective effects of kaempferol in the mouse model of Parkinson’s disease, kaempferol prevented the loss of TH-positive neurons induced by MPTP, a prodrug to the neurotoxin MPP+, which causes permanent symptoms of Parkinson’s disease. Kaempferol was found to be good for people who suffer from osteoporosis. In a study, it was found out that flavonols quercetin and kaempferol significantly increased alkaline phosphate (ALP) activity which then can stimulate osteoblastic activity. In the research of kaempferol, it was discovered that rats treated with the flavonol exhibited significantly higher bone mineral density in the trabecular regions — femur neck, proximal tibia, and vertebrae — and lowered serum ALP. In an investigation of moringa oleifera leaf extract, which contains quercetin and kaempferol, it was found that the leaf extracts from the plant had strong antiproliferation and potent induction of apoptosis. This indicated that the plant’s leaf extracts have a potential for cancer chemopreventation and can be claimed as a therapeutic agent against cancer. Another study found that kaempferol, together with other flavonoids such as apigenin and luteolin, has analgesic and anti-inflammatory effects contained in the Cassia siamea Lam. stem bark extracts. Another study also revealed that kaempferol has a potential clinical use for the treatment of allergic asthma. 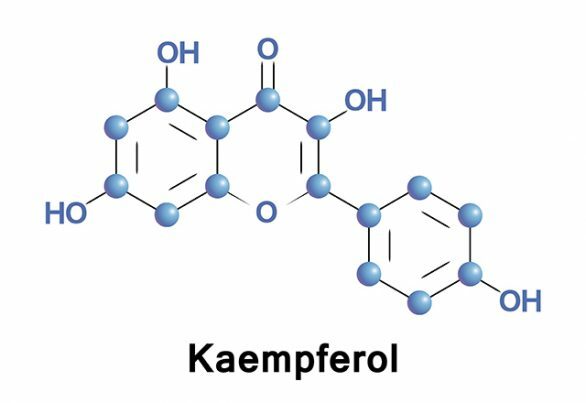 Aside from its cancer-fighting properties, kaempferol acts as an antioxidant and protects the body from damaging free radicals, which are harmful by-products of oxygen-based reactions. It also acts as an antidepressant and enhances metabolism. Furthermore, it acts as a phytoestrogen, which regulates estrogen levels in the body. It is also known to prevent arteriosclerosis, heart disease, and osteoporosis. Kaempferol is a flavonoid that acts as an antioxidant. It can help prevent cancer, diabetes, and heart disease. It also helps support heart and brain health.